Well, pre-wedding photography is quite a new trend. There was a time when before wedding the only shoot which took place was of engagement ceremonies that too was not done formally by a professional photographer, sometimes engagement pictures were clicked by some family member himself. But now with the advent of various styles and techniques of photography, pre-wedding photography is also introduced to the couples. Nothing has spread more like wildfire in wedding photography than pre-wedding photography. A trend that is only seeing the upward curve since its inception. 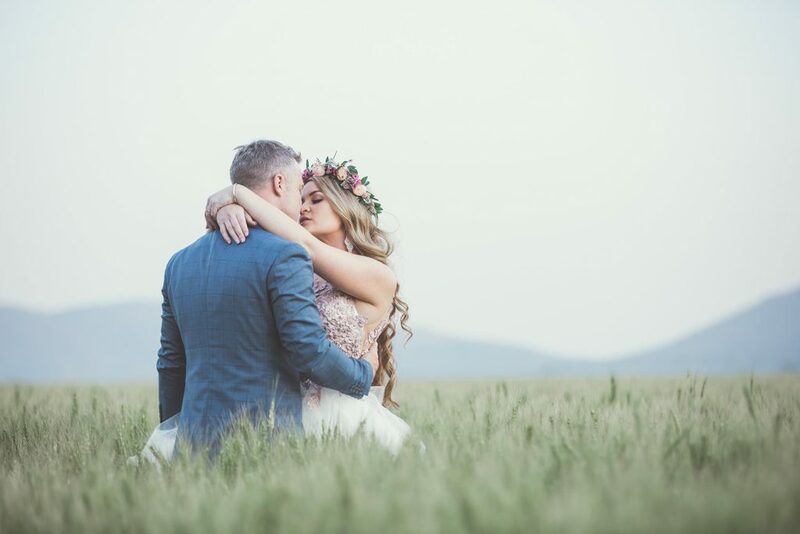 Gone are the days of those shy brides and the bewildered grooms, this is the era of knowing and owning your partner completely be it a love marriage or the one which is arranged, and nothing could be better than pre-wedding photography. Pre-wedding photography is shot before wedding in some prime location giving that some theme depending upon the mood, emotions and likings of the couple. Pre-wedding shoot gives couple a privilege to know each other in a better way. 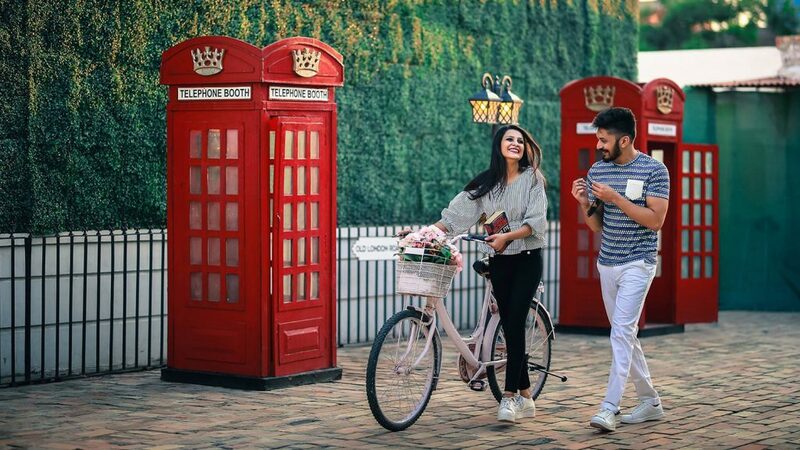 It allows couple to wear nice outfits, picking their favorite poses and locations freely without any interruption as this shoot is only meant for the couple. This is absolutely there time win each other for the life time. 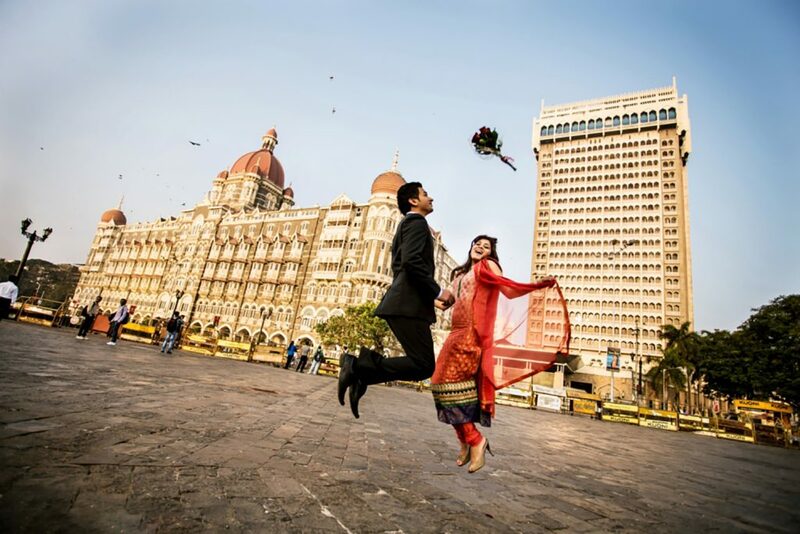 WHY PRE-WEDDING PHOTOGRAPHY IS IMPORTANT? Your wedding and no pre-wedding shoot… I can’t believe it. Nobody in fact would believe it, pre-wedding shoot is kinda mandatory shoot these days, how can one ignore the fun it has in itself. Pre-wedding shoots help to build the confidence in the couples for the final wedding photography. Pre-wedding shoot is a newest trend in the field of photography and the best one and is growing as it brings two people even closer. They get the opportunity to know each other. If the couple is absolutely new to each- other than pre-wedding shoot is best, it will help them know each other. On the day of their wedding if they are asked to hold hand they might feel shy or be surprised but because of this pre-wedding shoot they have that bond, they know each other at least a bit about each other unlike couples a decade ago. 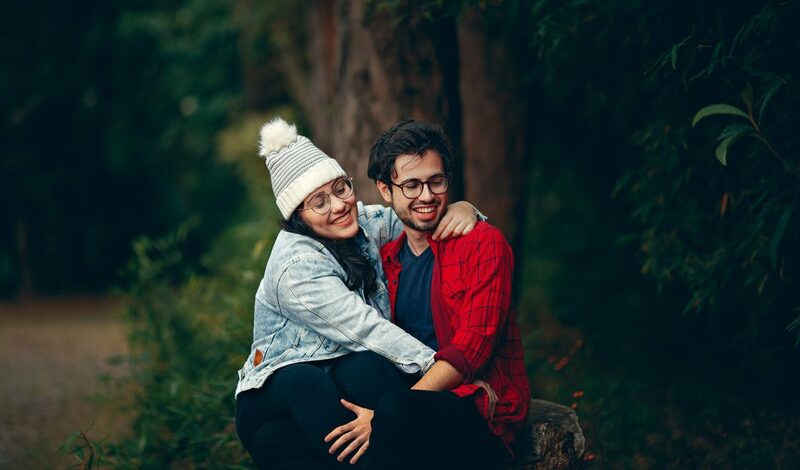 HOW IS PRE-WEDDING SHOOT DIFFERENT FROM ENGAGEMENT SHOOT? Don’t confuse pre-wedding shoots with your engagement shoots, both the shoots thought take place before the wedding itself. Still there is huge difference between the two. Engagement shoot more often than not, is done in one place, amidst lot many or few guests, couples wearing fancy outfits, in such shoots couples are not alone and most of the time it might be their second meeting since their wedding arranged, engagement shoots are more of a formal shoots off course your photographer will instruct you for few poses and if not then still it is formal in many ways. Conversely, pre-wedding shoot mostly take place in some other location, couples have chance to wear different clothes, not necessarily the shoot will be over in a day, it takes time as per the requirement by that time couples are comfortable with each other, they know each other well, it is very much informal shoot to bring two people closer and let them know each other for the life time. Wonderful memories for the lifetime to cherish and talk about even many years later. In engagement shoot you still feel shy to give your suggestions in front of family and relatives but in pre-wedding shoot you always have that prerogative to tell your wishes too. Not a very new trend in pre-wedding shoot ideas, but yes the most admired one, very popular and used quite often. 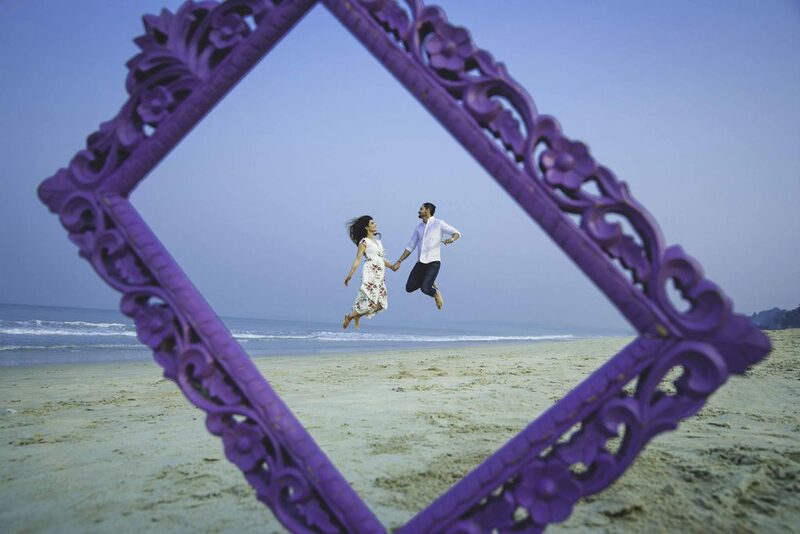 Frames look creative, dandy, and romantic, as they add to the overall love story of a couple soon to be wed-locked. Like frames, using props is again a lot much in fashion for a pre-wedding shoot. More often props like cycle, dupatta, umbrella, guitar and so add too much to a love story and make it a perfect one for their life time to cherish and show it to their children and grand-children. No less than a dream come true. A beautiful love story can be easily created under a dark sky swamped with stars and full moon. Pre-wedding shoot under full moon, does it sound romantic to you? Indeed it is, full moon nights are beautiful nights, the entire sky is swamped with stars twinkling as if witnessing your love story. 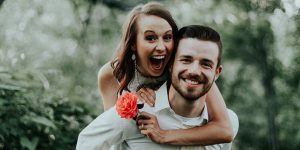 Your photographer will surely love the idea of shooting you with your to be spouse and giving your love story an entirely new aspect to go through in later years. Ahh, not really but yes this is a new trend in pre-wedding shoot. 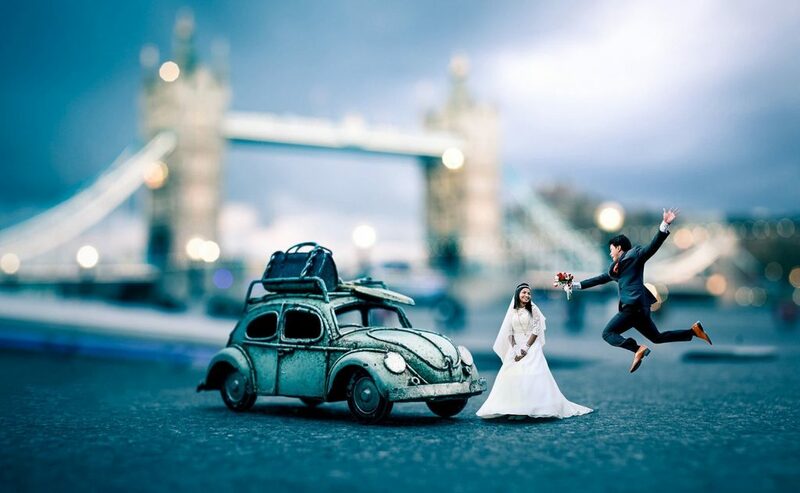 Miniature photography is very much in modern trend. 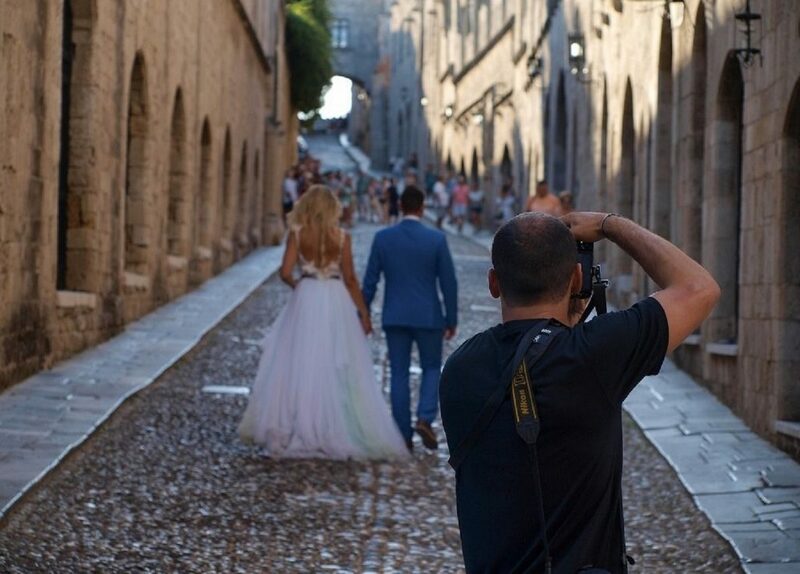 With this, photographers create real time interesting photos of the couple. Photographers really like the idea of creating surreal miniature portraits which look hilariously amusing. Any city, not necessarily yours. Traversing the city be it yours or others will be a real fun along with your to be better-half. It is very much in the trend. 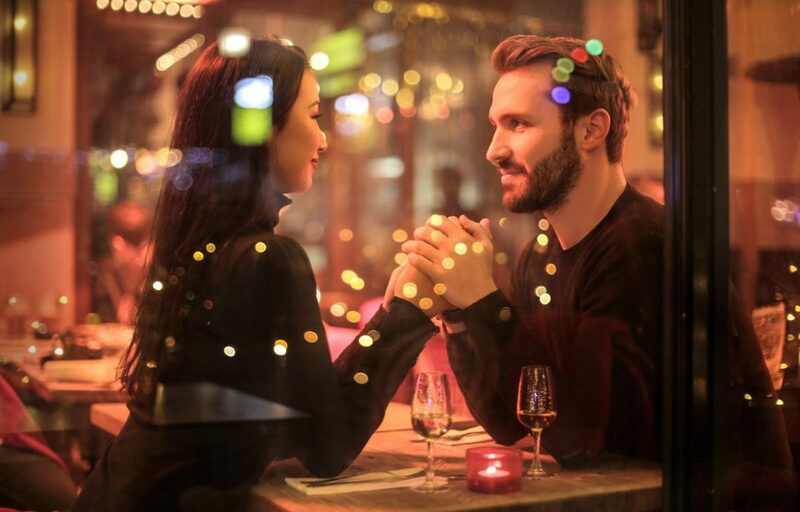 Chances are that you haven’t yet explored your city completely, this may help you to know your partner and the city more closely. 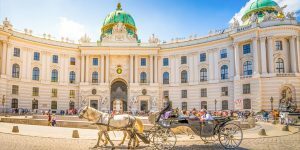 If your one of those lucky people who stay in and around the city swamped with beautiful historical monuments, then you can surely try to have your shoot there amidst beautiful historical creation. You might not become blase this time, as your to-be partner is with you holding your hand. Nothing can be more beautiful than this… what say?? Yes, lately bikers have emerged exponentially and most of them want to have their pre-wedding shoot on bikes. Even they are changing the old trend by coming in their wedding day on bike, it’s just pre –wedding shoot off course how can they go ahead without their bikes. Once a bike lover is always a bike lover. You must have seen it in movies, how romantic boat scenes do look, so would you mind one such romantic boat ride with your partner? I don’t think you would as nothing can be so romantic than a picture amidst water with the partner, eyeing each other with the heart replete of love. Every love story embarks with a date and dating your to-be partner will be super romantic. Pre-wedding shoots with romantic dates are hugely in trend. Have you proposed your partner? No, not yet, then don’t wait to propose her, she will surely like it and the rate rejection is highly negative. 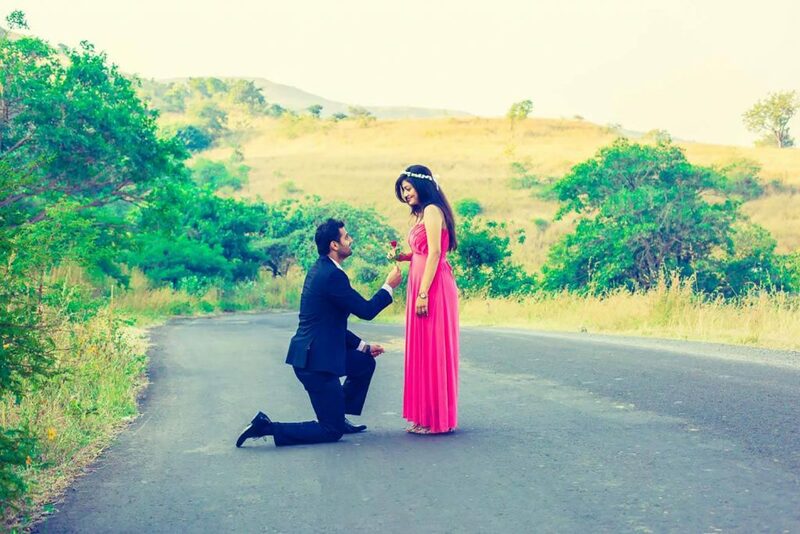 Off-course she is going to be your spouse in few days, but proposing her just few days before your wedding will give her the best of feelings. Give her that feeling, you will also be amazed to see her beautiful reactions full of love, emotion, dreams along with tears of happiness in her eyes. Yeah, some romantic shots, sound sizzling right??? Those romantic pictures just before your wedding will surely without any doubt add to the overall love story of yours. Not only this but it will bring in that comfort zone between you both, that is going to last forever. Go romantic then…!! 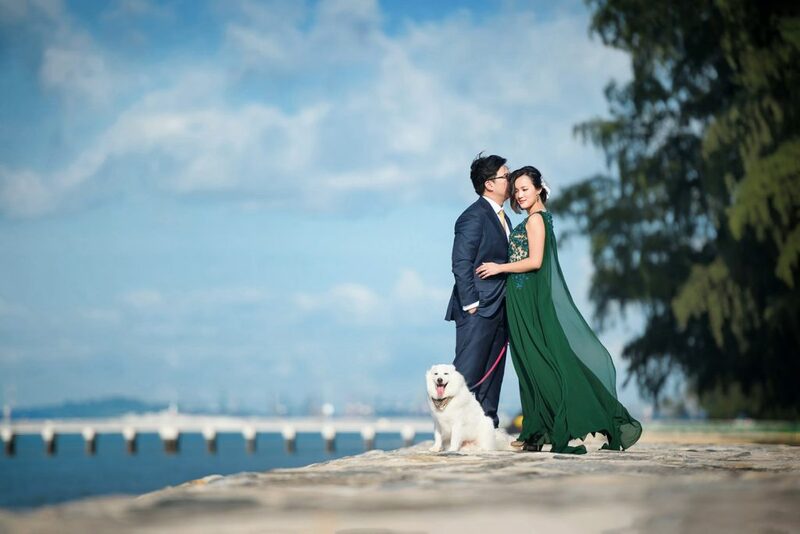 You might be among those who love their pets more than anything, surely you would love the idea of having few clicks of your pre-wedding shoot with your pets. It will surely help your better half to become comfortable with your pets. Just imagine, you with your to-be spouse amidst rain and snow, how wonderful the whole shoot would be. 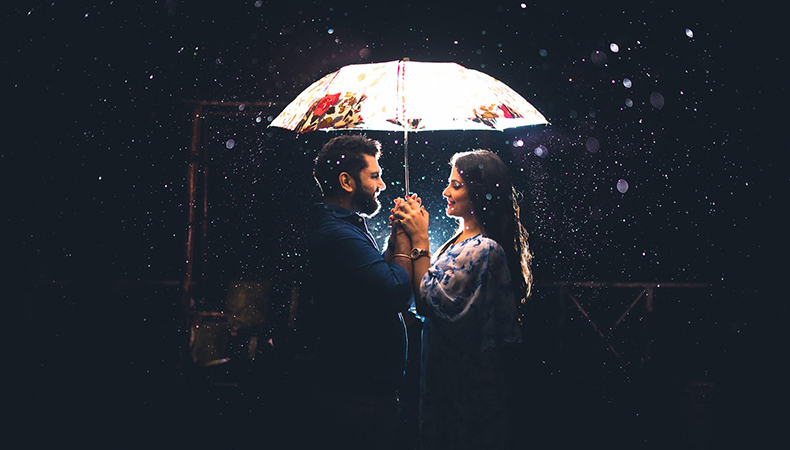 Yes, pre-wedding shooting in rain and snow is also in trend these days. 14. Do you love nature? Are you guys among those blessed ones who are born and brought up in nature’s lap. Wow, it will be too romantic pre-wedding shoot in the lap of nature, does it sound amazing to you? Then definitely you should not miss the chance of shooting there in the most romantic ways. Sound great, isn’t it. People who love beaches then this could be the best idea for them to go ahead with. Pre-wedding shoot beside a beautiful beach is too much in trend these days and couples are kind of taken with the idea. Go ahead, go beachy….!! If you are a real busy couple, can’t travel to far places for your pre-wedding shoot or you really want to explore your wedding venue before the final wedding, then the idea of pre-wedding shoot at your wedding venue is also great. 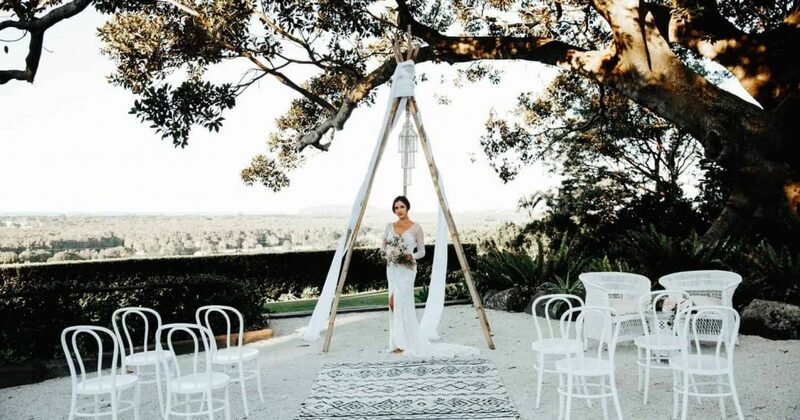 It will give help understand the whole venue, good for your photographer too, he will also be accustomed to the place by the time your wedding happens. 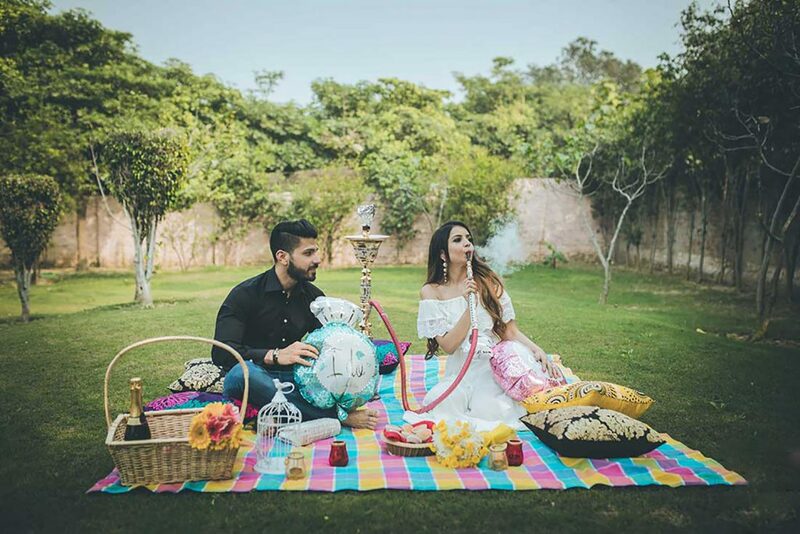 Smoke bombs are just not used in some birthday party only, now they are used to give that extra tinge to your pre-wedding shoot, believe me very much in trend. Not a very new trend off-course, but yes photographers get too much to rummage and bring about something extra to your shoot. Amidst tall trees, open sky, green grass there is lot to be traversed. You might wonder picnic that too only two of you, how’s that going to be. Because back of the mind we only know picnic in large groups. But trust, this is going to be a great picnic of your life, some relax moments, romantic feelings, love brimming, a beautiful picnic date with your other half, chit-chatting, knowing each-other tad more. Great idea, what say..!! Wow!! Fun you see, giving the entire pre-wedding shoot a filmic theme is no bad idea. Shooting a video and songs running in the background, no less than a super-hit romantic Bollywood movie. Your photographer will also be amazed with the overall idea. If you are one of those who are extremely filmy by heart then nothing can be better than this. Filming your own sweet love story to cherish forever. Newest trend, yes, absolutely. 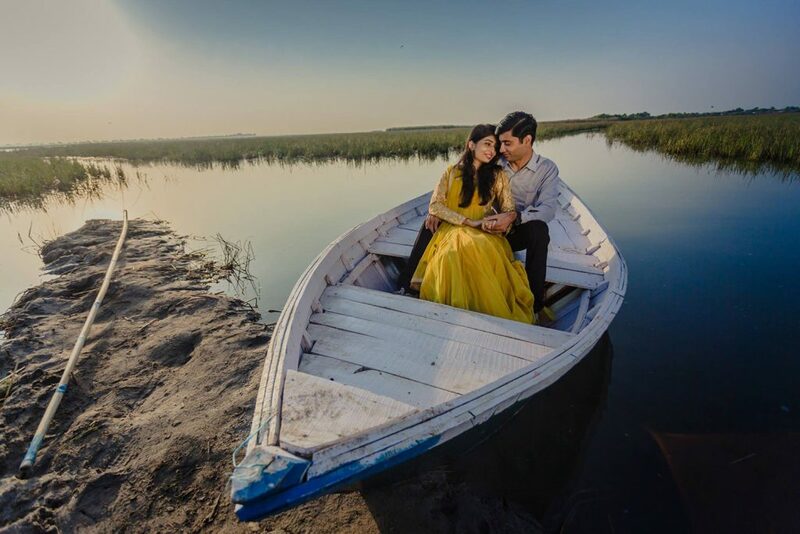 Introduced something mesmerizing, a very new trend in pre-wedding photo shoots and really making its way into wedding photography by capturing Ariel couple poses with the help of drone. Gone are those days when drones were used for military purposes or to espy someone or something. 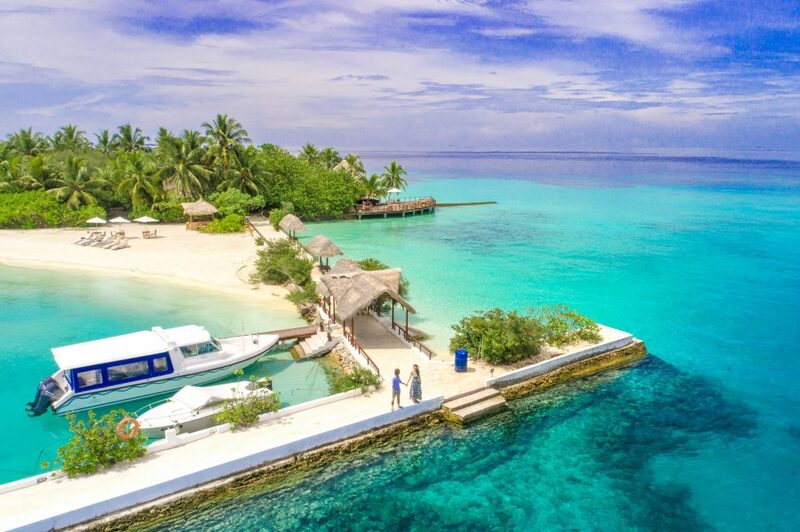 Imagine you along with your better half environed by beaches and that perfect shot is captured from the sky. The only thought gives you that romantic Goosebumps. How about trying the shot itself?? You will surely feel like some Bollywood lead posing for some romantic movie to be released soon. It may seem surreal, but once you get a chance to have those shots with your to be groom, you will be transfixed. Try out!! 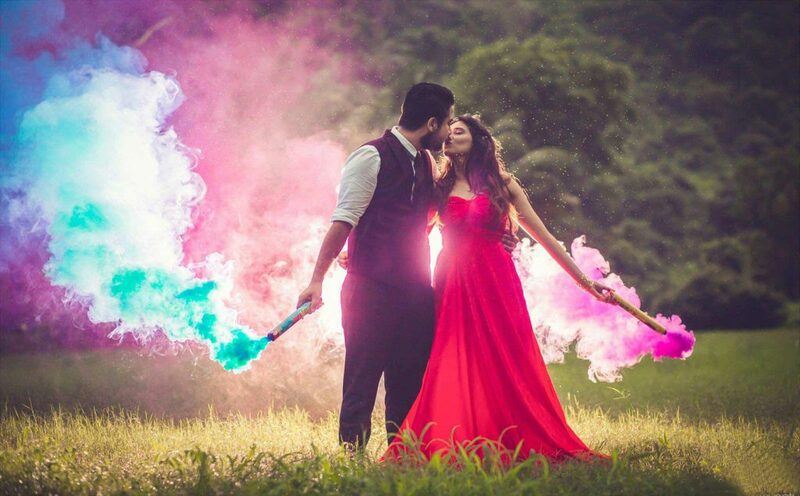 These are few new trends, but if you are the person having your own fantasy for your pre-wedding shoot then definitely go ahead as it is going to be sizzling hot and absolutely new and different, other couple might want to have pre-wedding shoot like yours. 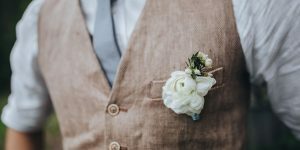 Booking a pre-wedding shoot photographer and final wedding photographer separately will be quite a monotonous and hectic task. As it takes time to know your photographer and by the time you will one, the time for final wedding will come and knowing another photographer will take a lot more from your whole schedule. It is always good to go with the one. 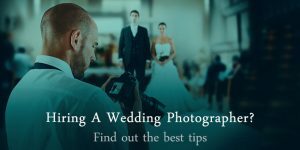 Hence, when you are exploring the right photographer for your wedding make sure that you see all the parameters there and then only, it will save your time and efforts later. Make sure that the photographer you are booking for your final wedding day is skilled in pre-wedding shoot also, it will be sort of life-saviour decision forever. Taking care of two different photographers is no easy task. Also, collecting pictures after wards will also be easy if it only one. Otherwise you may keep chasing one or other for the pictures. 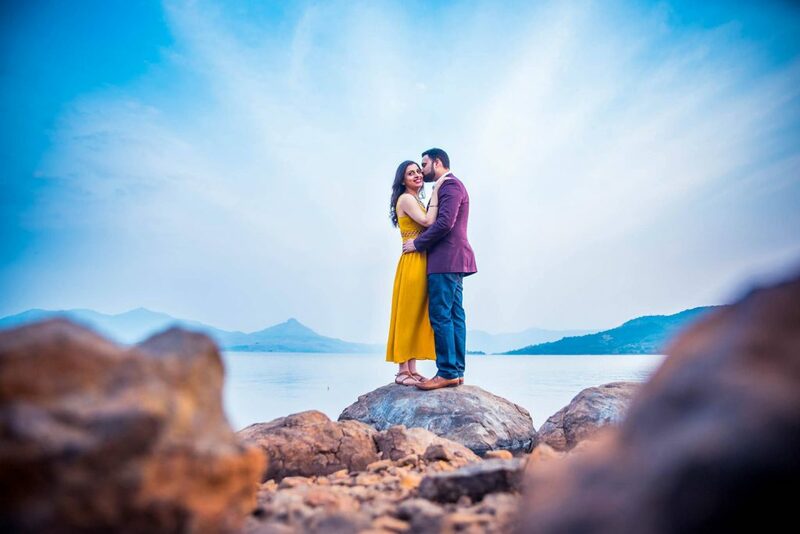 Before booking see his gallery of pre-wedding shoot and final shoot as well and only when you are convinced with his work, all your queries are answered satisfactorily then you know, without wasting a moment you have to book him. Get going….! !